The quieter Out Islands are the real Bahamas to many people. These remote islands are intriguing to discover and explore. Some of them can only be reached by boat, and the friendly residents who have lived on these islands their whole lives can often relate interesting stories about the islands. Travel and communication between the Out Islands has been difficult over the years. Treacherous reefs, shoals, and sand bars lie under the clear blue water, which has required careful navigating. Sailors and boatbuilders made these islands their home, and for many years, the only transportation was the fishing boat or the mail boat. Air travel between the Out Islands began with a simple floatplane in 1919, but today these islands are easy to reach. Bahamasair and several other commercial airlines provide scheduled air service to the Out Islands, and fast ferries offer service between Nassau, Eleuthera, and other Out Island destinations. The Abacos islands are located north of Nassau. Once a center for shipbuilding, they have long been self-sufficient. As home to some of the Harbour Islanders, and also to refugee British Loyalists following the American Revolution, the Abacos developed as a fishing community with colorful traditional houses. When the Loyalists arrived at Treasure Cay, they established farms in the island's interior. Although some agriculture does remain today, these farms were largely given up in favor of living on the cays. Boatbuilding and fishing remain important to the local economy, but these Out Islands have also embraced tourism, and the Abacos have popular resorts which often include marinas. 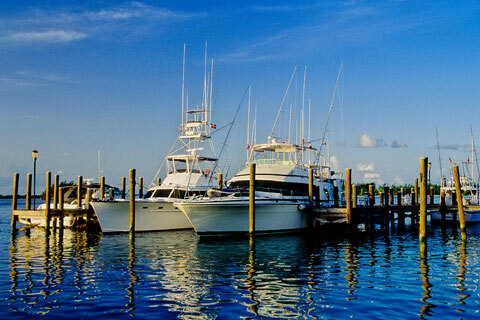 On Great Abaco Island, Bahama's third-largest city (Marsh Harbour) attracts yachts and boaters. Divers and snorkelers will be interested to explore large numbers of underwater shipwrecks, relics of a long history of piracy. Located about 240 miles southeast of Nassau, these two little islands together form the shape of a boomerang. Christopher Columbus is said to have labeled Crooked Island as "Fragrant Island" due to its aromatic herbs. In the present day, these quiet, remote islands attract sailors and fishermen. The largest island of the Bahamas, Andros lies west of Nassau, New Providence, with the third largest population in the Out Islands. Andros attracts serious serious scuba divers to the coral gardens and walls of the Andros Barrier Reef, whose 170-mile length is only surpassed by Australia's Great Barrier Reef and Central America's Mesoamerican Reef. Deep sea fishing and spear fishing are popular here as well, and the Lowe Sound settlement has become an important bonefish center. Andros' large pine forest is the habitat for the Bahamian parrot, white crowned pigeons, and other birds. Andros is also home to numerous crabs and Androsia Batik, maker of traditional Bahamian batik fabrics and resort wear. The 30 Berry Islands and their 100 nearby cays provide lovely settings for diving, snorkeling, and sport fishing. The town of Bullock's Harbour is located on Great Harbour Cay, and some Berry Island cays are privately owned; most of these islands and cays are uninhabited. The Bimini Islands are only 50 miles east of Miami, Florida. They are very flat, and were home to writer Ernest Hemingway for a time. Bimini comprises a number of islands, including North and South Bimini as well as islets and cays. This is where the Gulf Stream meets the Bahama Banks. Bimini now attracts fishermen and divers. Big-game fishing is excellent throughout the year but, as with other islands, high season is usually winter. This quiet, traditional island in the east-central Bahamas features 206-foot Mount Alvernia, the highest point in the Bahamas. 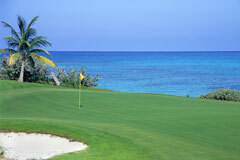 The island is located between Long Island and Eleuthera Island, and has virgin beaches, undiscovered by most travelers. Founded in 1648, Eleuthera was the first permanent settlement in The Bahamas. Settlers came here from Bermuda for religious freedom, naming the island "Eleuthera," the Greek word for freedom. Eleuthera is a long, narrow island of unspoiled beaches, rolling hills, and sheltered coves. The island features limestone caves and good surfing beaches as well as casuarina trees and small, tasty Eleuthera pineapples. Eleuthera's people are mainly farmers, fishermen, and shopkeepers who live in picturesque pastel cottages. Resorts on the island are clustered around the good harbors. Eleuthera and its neighboring islands offer excellent snorkeling and diving opportunities among coral reefs and shipwrecks. 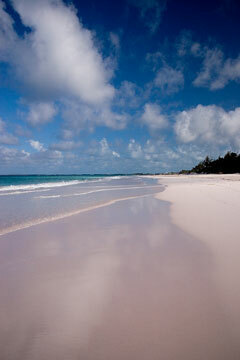 Nearby, tiny Harbour Island boasts a pink-sand beach visited by fashion photographers, celebrities, and sunbathers. Only 3 miles long and less than a mile wide, Harbour Island features several resorts along its safe eastern beach, which is protected by an outlying coral reef. Sailors enjoy the Exuma chain of islands for their crystal-clear waters, private beaches, and lack of tourists. They are a cruising ground for sail and power boaters, and many of these islands can only be reached by boat. The Exumas are home of the Exuma Cays Land and Sea National Park and Thunderball Cave, where snorkelers can swim in a majestic cavern with thousands of fish. 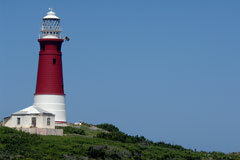 If necessary, accommodations can be found in George Town, the capital of the Exumas. Pirates used the harbor in the 17th century, and the U.S. Navy used it during World War II. Shopping in George Town is limited, but there are some handicrafts and souvenirs available. Great Inagua is the most southern of the Bahamian Islands. It lies between Cuba and the Turks and Caicos Islands, and is characterized by low hills and salt flats. Morton Salt Company produces salt on this island by evaporating sea water. Little rainfall and constant trade winds are ideal for this purpose. Inagua National Park features a flamingo reserve which is home to the world's largest colony of flamingos. Bahamas parrots can also be observed on this island. Long Island is long and narrow, with rocky cliffs on one side and beaches on the other. This island provides farm goods to many of the other islands. The island is becoming more settled, with some new resorts being planned. A few small resorts and shark dive sites lure many scuba divers. The Dean's Blue Hole, with a depth of 660 feet, is near the capital of Clarence Town. In other areas, there are white sand beaches. A long way from the Capital city of Nassau, Mayaguana Island is rugged and seldom visited. It is the most easterly of the Bahama islands, and the island is sparsely populated, because there are few jobs on the island other than fishing or farming. There are few organized activities on Mayaguana, but the popular island activities of snorkeling, diving, swimming, sailing, and fishing are still options. It makes an interesting place for yachts to stop. Migration of Loyalists after the American Revolution was a major factor in populating San Salvador. These Loyalists ran cotton plantations, but after the 1830s, when the slaves were emancipated, cotton farming was no longer profitable, and much of the land was left to freed slaves. Today, the old plantation buildings lie in ruins. Known as Guanahini by its original inhabitants, San Salvador claims to be the place where Christopher Columbus landed in 1492. It is a quiet Bahamas island with white sands. The empty beaches run for miles, and there is a Club Med resort on the island, as well as a few restaurants serving local cuisine. Rum Cay lies southwest of San Salvador. It, too, was settled by Loyalists who grew pineapples and raked salt to eke out a living. Today, tourism and real estate development are the primary sources of employment. Port Nelson is the capital and contains a harbor.